Project Description: Learn how to create your own custom stacked bracket thank you cards with Grafix Shrink Film. Cut 4 ¼ X 11 piece of black card stock and fold in half to make card. Cut a 5 X 7 piece of white card stock, place in Color Catcher and lightly spritz using Banana Spray; let dry. Stamp inked card stock piece with polka dot stamp and Pumpkin Pie Dye Ink; trim to 3 3/4 X 5 and distress edges using Pumpkin Pie Dye Ink. Adhere to card front. Adhere ribbon across card front, slightly above center. 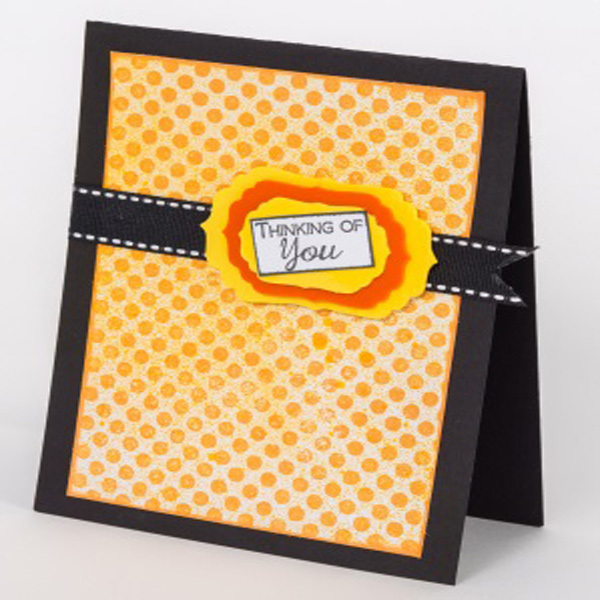 Use largest die to diecut a bracket piece from Yellow Shrink Film, use second largest die to diecut a piece from Orange Shrink Film, then use fourth largest die to diecut a piece from Yellow Shrink Film; bake according to package directions then let cool. Stack and adhere bracket pieces using 3-in-1 Glue; adhere to card front along ribbon towards right side of card. Stamp sentiment on a piece of white cardstock using Wicked Black Dye Ink. Trim close to sentiment and distress edges using Wicked Black Dye Ink and adhere on a slant to center of stacked bracket pieces.